The project: In 2003, Mark Widder commissioned Grand-Craft Boats for a custom built replica of a 1929 28-foot Chris Craft Runabout. At the time, Grand-Craft was owned by Richard Sligh. “We’ve never built a 28-foot double upswept, but if you give me a year I’ll build you one,” Sligh told Widder. 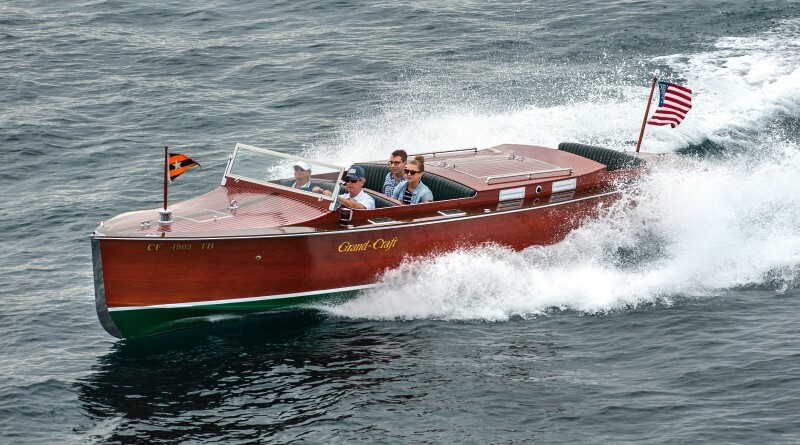 The boat was hand-built from Honduran mahogany by Grand-Craft Boats in Holland, Michigan. “These are all built by hand, one piece of wood at a time,” Jeff Cavanagh, current owner of Grand-Craft, is reported as saying. Grand-Craft Boats supplied Widder with monthly progress reports/photographs of the boat being constructed throughout the year. “As far as I know, our boat is a ‘one off’ and they never did build another 28-foot triple cockpit,” Widder said. The steering wheel is a vintage 1930s Banjo Wheel from an original boat. There is also an old vintage brass fire extinguisher onboard. “Ranging in price from $120,000 to $1.5 million, Grand-Craft boats have been sold to celebrities such as Robert Redford, Jennifer Lopez, Tim Allen and Kid Rock,” The Holland Sentinel reported. Why a replica: Mark Widder’s appreciation for wooden boats came from his upbringing. He grew up with an uncle who was a boat owner and a father who was always building something out of wood. His father’s jobs early in his career involved working as a wood pattern maker for aerospace companies. Widder’s uncle would take his family sailing on weekends to Catalina aboard a 1964 35-foot Ericson sailboat. Widder and his wife considered an original boat but ultimately decided on a replica of a classic. The name: Widder, his wife, son and daughter all put suggested names for the boat in a hat. His son’s choice for the name Firecracker got picked. “I was a bit apprehensive having any kind of name for a wood boat with the word ‘fire’ in it but in the 4th of July boat parade, it is the perfect name,” Widder stated. Home Base: When Firecracker is not cruising around Newport Harbor, she is stored at the Lido Drystack in Cannery Village. Slipstream Marine Management in Costa Mesa services her and maintains her wood finish. Award: Firecracker has been entered in numerous boat shows under the “replica class” category. She has won “Best Runabout” twice in the Newport Beach Wooden Boat Festival.